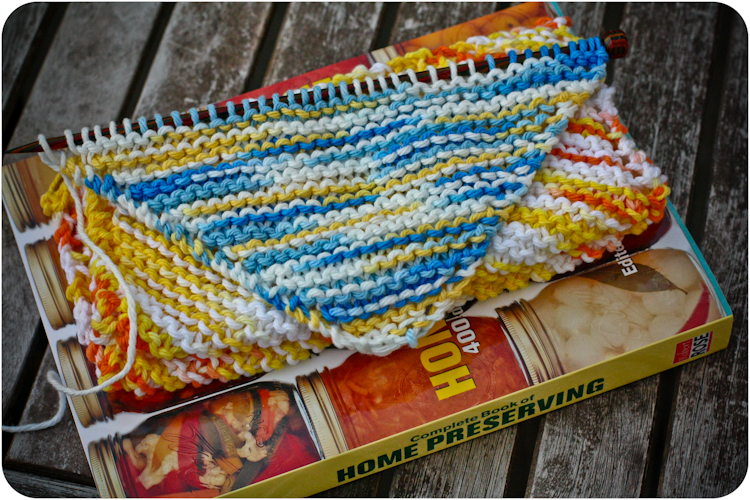 Joining Ginny for Yarn Along again this week. I'm working on a few easy mindless things since completing the scarf I was working on. 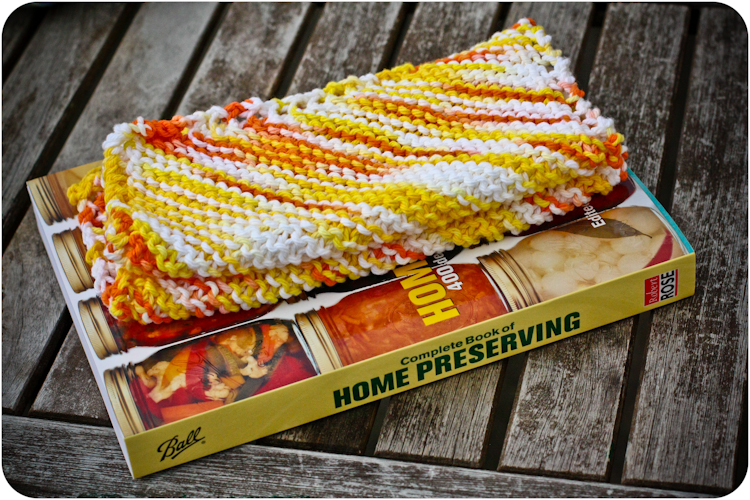 I whipped out a few dishcloths in a sunny yellow and orange since our old ones are getting pretty dingy. Now I'm making a few to give away. Ahhh Home preserving... I am happy to be just finished with the bottling season, gosh it had me running about, Go well with it and nice colours on the dishies. I love those colors--what a great spring project-so cheerful. AHH home preserving--I would love to try that! I can not wait to hear your results! Cute clothes. I also love the last food post. I want to make sourdough bread! Looks so good. I love dishcloths. I also use mine as hot mats. They work great either way. My goal this year is to make strawberry jam. I've never done it but have a few great resources that make it seem so easy! Scheming - now that is a fun word for canning ideas! The blood orange sounds good. We've just made the basic strawberry jam and last year made a cherry jam. That was good. I still need to conquer my 'fear' of home canning. Dishcloths look good - must really try making some of these again. You can never have too many dishcothes, I tell ya! Those dishcloths are really pretty! My hubby wants to get started in canning this year so I may have to look into that book for myself! I love that you coordinate your knitting with your books. Which came first? Looks like a good book. I make loads of home preserves, but each year I like to try something new. Some past experiments are still skulking in the back of the cupboard, but most work. That's what keeps me trying!